Doctor Who Meets Top Gear | Warped Factor - Words in the Key of Geek. Petrolheads rejoice, for Top Gear returns to your screens tomorrow. 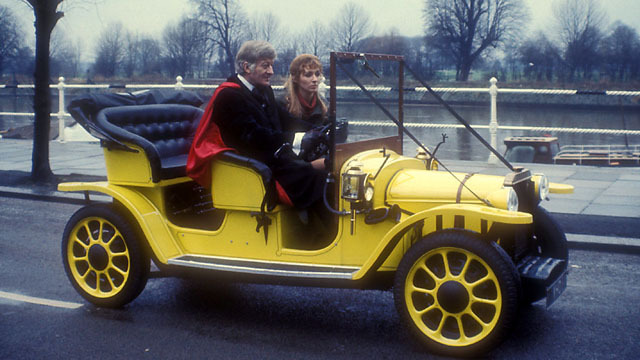 And those with fond memories of Jon Pertwee's time as the Third Doctor could have more cause than most to reminisce fondly- remember good old Bessie? The yellow dream machine accompanied the by now exiled to Earth Doctor for the majority of his early years, at least before he got his preferred mode of transport back & was able to leave our little planet behind, though of course he'd pop back every once in a while in subsequent incarnations! It shouldn't be forgotten either that Top Gear itself has been forced to regenerate, Jeremy Clarkson having been exiled & Chris Evans standing by to take his place without so much as a handover - think Colin Baker to Sylvester McCoy all over again, or indeed Patrick Troughton handing over to Jon himself. 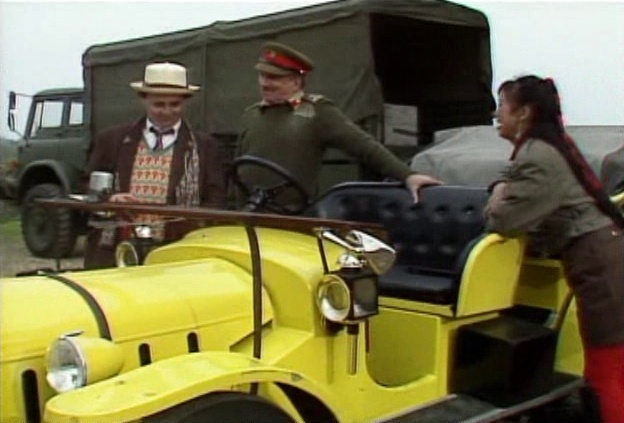 Spearhead From Space was of course our introduction to the Doctor's first & so far only four wheeler of a companion, a sweetener in his agreement to work for UNIT, and quite the company car. "And there's that car, too. Yes, you know, I took to that car. It had character." DOCTOR: Outgrabe. Oh, hello, Liz. LIZ: You'll never get that thing running. DOCTOR: Oh, don't you be so disrespectful. I'll have you know this is a car of great character. I was very lucky to get her. LIZ: Are you really going to drive about in it? DOCTOR: Yes, certainly. I've nearly finished my modifications. I thought we'd take her out for a trial run in a minute. It wasn't all warbling a few bars of Jabberwocky while souping her up, though. As he'd earlier noted, the motor had quite a character & the modified mind of its own he'd given it could lead to disagreements. A simple beating would never do, though! Reasoning with the thing was the best tonic, going by what we witnessed in The Daemons. DOCTOR: Bessie, how dare you go gallivanting around like that. DOCTOR: Very well, I forgive you. Now go back to your parking place before I change my mind. 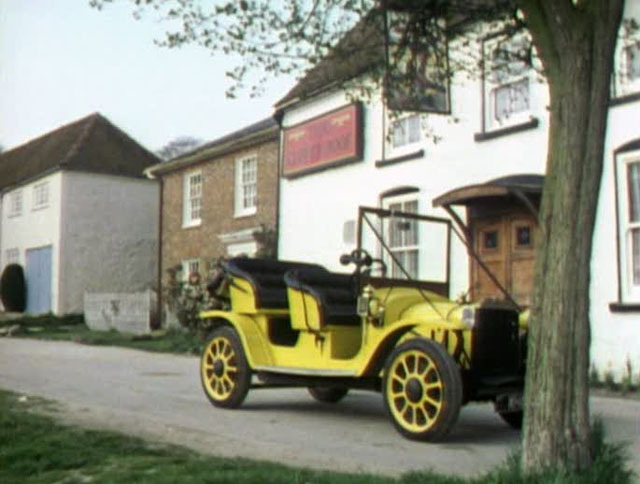 Bessie often popped up throughout the Pertwee years, including a final major role in Jo Grant's swansong The Green Death. 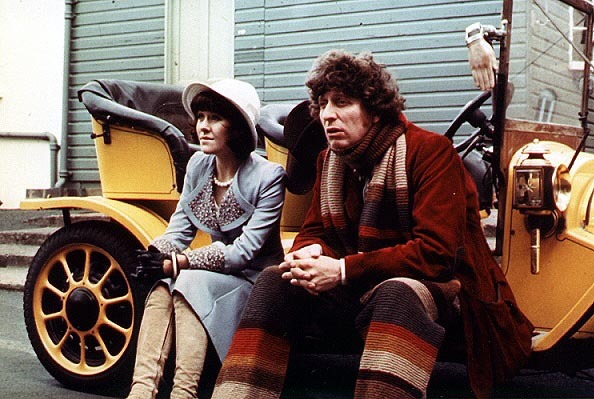 Unsurprisingly, given that it has all the trappings of stories from his predecessor's era, the Fourth Doctor's first full appearance in Robot also finds room for a cameo from the car he'll soon mostly lose interest in. She'll ride again three selves later, dusted off for Battlefield alongside some old UNIT passes. DOCTOR: Wait a minute. Ah yes, of course! I never thought I'd need these again. This should remove a few obstacles. ACE: Who's Elizabeth Shaw? I don't even look like her. DOCTOR: Oh, never mind. Just think like a physicist. Battlefield was something of a love letter to the Pertwee era, so it's no surprise that Jon's favourite boys toy also featured. "Bessie, the yellow Edwardian roadster, became a firm Who fixture. 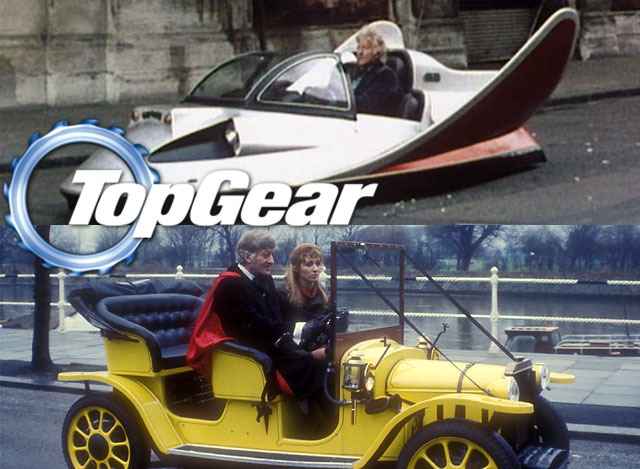 And there were outings in a hovercraft and also Pertwee’s own custom-made but utterly ludicrous Whomobile"
"It could do 105 mph. It's the only thing I've ever seen that moves lorries. Once they look in their mirrors and see you've got no wheels they quickly shift over!" How was it built ? Tech Republic has the answer. "Farries managed to stymie other car designers when he was able to build the WhoMobile out of fiberglass with just two castings. Though it lacks doors, The WhoMobile does have seat belts, lights, and indicators (turn signals). The interior controls feature a functional television and cassette player. An on board computer blinks lights, and Pertwee once explained that the computer was for running tests and flying. There is no trunk, as it has a rear engine. It actually lacks storage all around, even for people." Amazingly it could be used for regular travel! 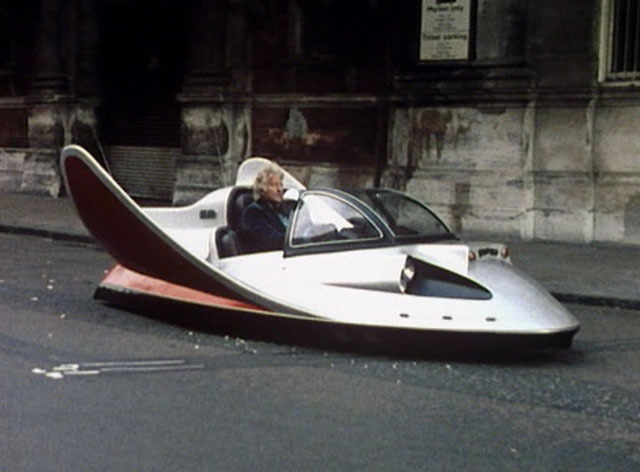 "Pertwee eventually managed to have The WhoMobile certified as road worthy. He did drive it regularly, which was sensible as it got about 50 miles to the gallon in gas consumption and was able to drive as fast as 100 miles per hour. He eventually stopped driving The WhoMobile around town, as more than one accident occurred when other drivers were busy gawking and not watching the road." Who could blame them for wanting a look, we say.